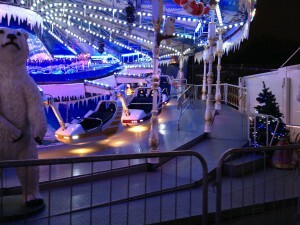 I could have made this an addendum to the original post about the Winter Wonderland, but I decided not to, since a new post means I can then I have Friday all sorted out, and then move on into the weekend. Plus, if I added to the original post, then it would be awful long, and people have a short attention span. I know, I know, tl;dr. Update: Hrrump, well, it’s the weekend already and I’m behind on this post but in my defense it was because we had to get an early start yesterday to go to the Harry Potter Land of Supreme Excellence. More on that later. So continuing on with the theme of Christmas Fairs and the strange things you find at them that qualify as attractions, I have two more submissions. The first is this poster board out inside one of the rides, which raises several questions, all of which will never unfortunately be answered. 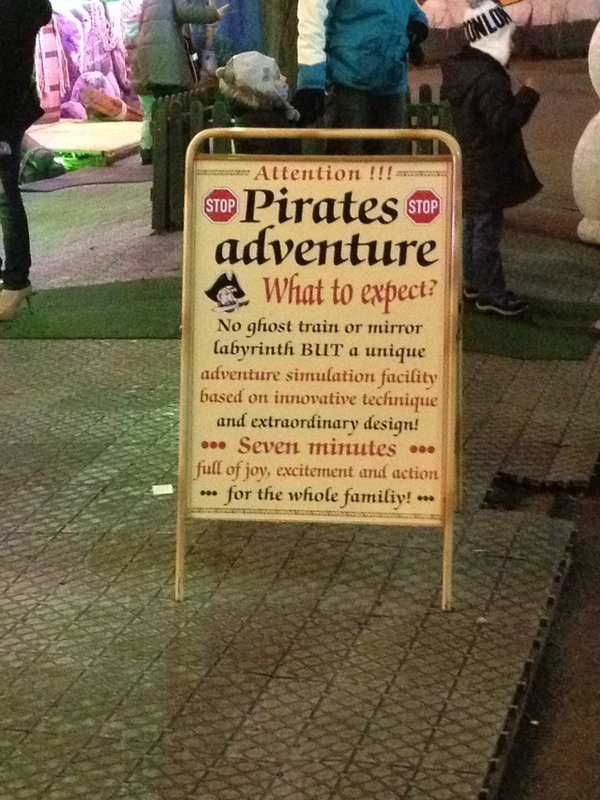 Like what does a pirate ride have to do with Christmas or even, in a more secular vein, with winter in general? Arr. “Mateys, we be having a real Pirate Christmas! Break out the rum and wenches, yo, ho, ho!” There is the ‘yo, ho, ho’, which contains within it the iconic laugh from Saint Nick, so I guess if you stand way, way back and squint a lot it can look a little bit like Christmas. Then there’s the tone of the advertisement. ‘A unique adventure simulation facility based on innovative design! 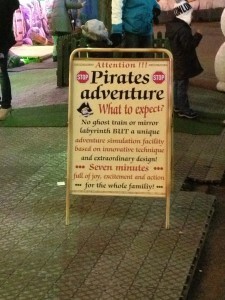 Seven minutes of joy, excitement and action for the whole family.” So what exactly is simulated? Do you get to act as the hapless colonists in a Spanish Central American port as the pirates give it a good sacking. Personally I’ve always been up for a good sacking, though truth be told, it’s probably a much better deal to be a sacker rather than a sackee. Do you get to enjoy a simulated keel-hauling or flogging? So many fun things to do and only seven minutes to enjoy it all in. 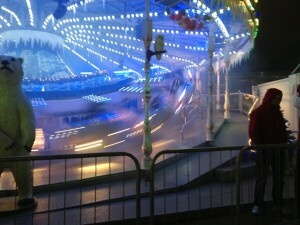 Then there’s this ride, which is the most terrifying attraction I’ve ever seen. This is what it looks like at rest. Now this is what it looks like at speed! This isn’t just the camera unable to keep up with the action. My Mark I eyeballs saw nothing but a blur when this thing reached somewhere north of Mach 5. I think it was going so fast that ice crystals were condensing in the air surrounding it, much like contrails form at high altitude when a jet zooms through the atmosphere. 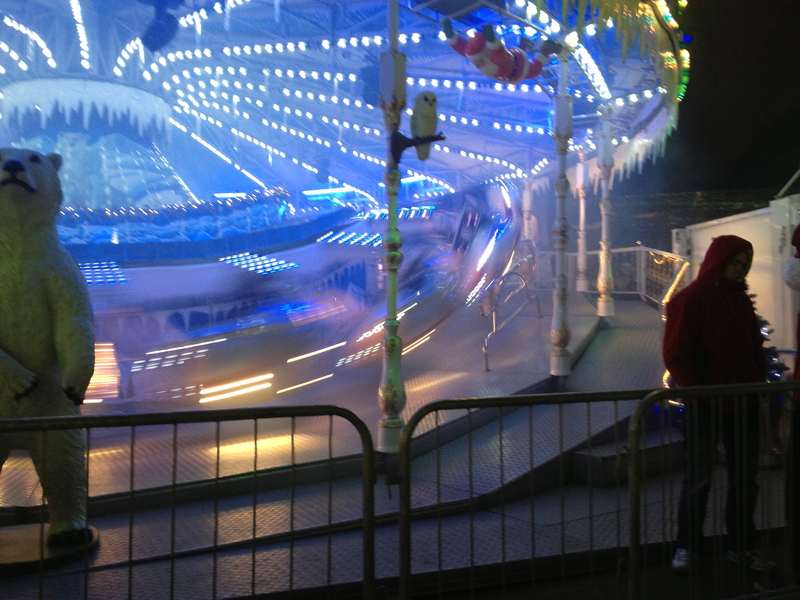 Either that, or the speed of the ride is so great that time is actually starting to slow down, so we can see the motion of the individual molecules in the air, and that’s why it looks hazy. This contraption literally scares the dickens out of me, and that’s only because I’m in England. Back in the States, where we’re much more earthy, which some might describe as crude and uncouth, it would scare the living crap out of me. I’m amazed that they can find people who want to ride it, because when you think about it, not only is this ride much faster than any sane ride should be, it’s also a carnival ride with the attendant questions (in my mind) about somewhat slipshod maintenance. 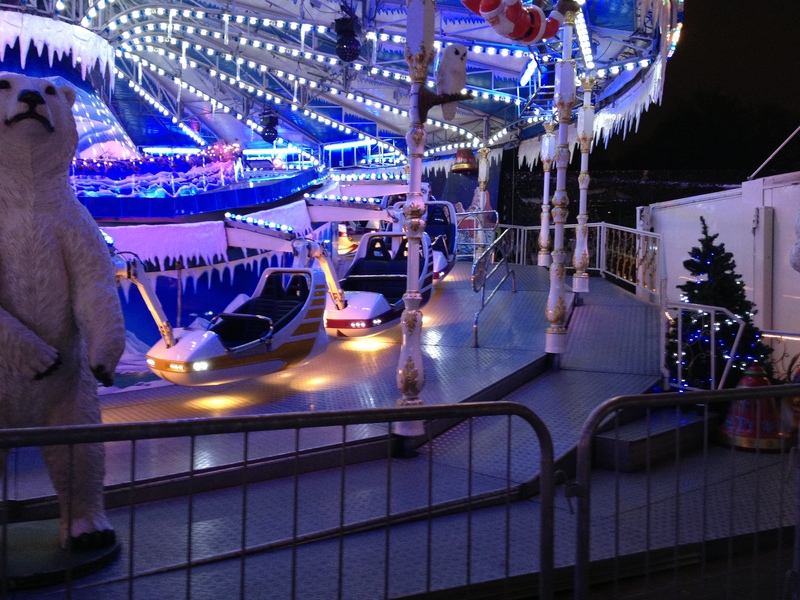 Anyway, that concludes the disquisition on Winter Carnivals and such, till next year at least. I promise.